This film is the first installment of the trilogy Legion of Slaves. 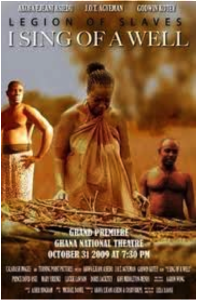 Set in the ancient Ghanaian empire in the time of the Mali Kingdom under Mansa Musa’s rule, I Sing of a Well tells a story of life before the arrival of Europeans and the emergence of the West African slave trade. The plotline focuses on issues of love, passion, and abuse of power. Prince Wenambe wins the throne from his father after he pledges allegiance to Mansa Musa for protection against slave raiders. In order to take on this position, Wenambe requires a wife. He desires Soraya, who is already betrothed to Dume, a hunter. Stemming from his jealousy, Wenambe has Dume killed and forces Soraya to become his queen although she is pregnant with Dume’s son. Prince Wenambe falls into depression as Soraya’s apathy toward him remains unwavering and his plan to protect his village backfires when Mansa Musa begins to enslave his people. Pan African Film Festival: 2011 Filmmakers Awards. Journal of Pan African Studies 4.3 (2011): 189+. Literature Resource Center.